Discover at Centre Pompidou the first major French retrospective devoted to Victor Vasarely. Explore the "Vasarely continent" with three hundred works, objects and documents. Stroll through a tour that is both chronological and theme-based, exploring all the facets of the rich and diverse work of the father of optical art and all the aspects of its production: paintings, sculptures, multiples, architectural integrations, advertising and early studies. The Foire du Trône is back from April 5 to June 2, 2019, on the Lawn of Reuilly in Paris. With 350 attractions and 80 rides, the Foire du Trône will thrill younger and older people for its 1061st edition! Exceptional evening on Friday, April 5, 2019: the fairgrounds are mobilizing to fund research and training in heart surgery by offering the entire recipe to associations. For only 25 € per adult and 15 € per child (under 10 years), you will have access to 50 rides and attractions and spend a festive and gourmet time, for the good cause! In short, having fun while doing a good deed, why do without? The Musée Jacquemart-André, owned by the Institut de France, presents collections of art that are worthy of great museums in a magnificent Second Empire mansion. Often compared to the Frick Collection in New York, it has maintained its mansion atmosphere, which makes it unique in Paris. This museum lets visitors discover 19th century living areas: ceremonial rooms, monumental stairways, winter garden, private apartments and more. 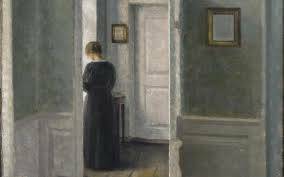 Vilhelm Hammershoi, the master of Danish painting, is exposed until July 22th! The 70 dancers of the universal ballet present for 4 exceptional performances at the Palais des Congrès in Paris, one of the greatest classics of the repertoire! Based in Seoul, universal ballet embodies the union of harmony and grace of Asian cultural thought, with the strength and beauty of western classical dance. Worried about preserving the rich tradition of European classical ballet while embracing the new choreographic trends, Universal Ballet is considered to be the driving force of classical ballet in Korea, and today is among the most prestigious companies in the world.